Assana Alio has over six years work experience in public services as well as in business. She holds extensive experience from the African Development Bank, United Nations Department of Economic and Social Affairs and U.S Bank. Assana is a bilingual (French, English) International Affairs professional with proven experience in African development projects, evaluation of social and economic development programming and processes, international business, financial and organizational management. 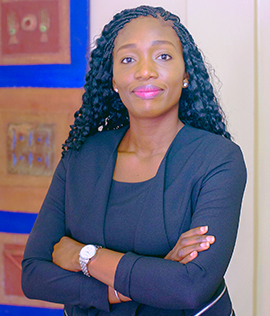 Ms. Alio is a board member of Diaspora Capital LLP (dCAP), a Sub-Saharan Africa-focused impact investment vehicle which democratizes impact investment by leveraging “citizen capital” from Africans in the diaspora to provide alternative access to finance and management support to SMEs in Africa. Ms. Alio holds a Master’s degree in Public Administration from Georgia Southern University in Georgia, USA and a Bachelor’s degree in International Affairs from Kennesaw State University in Georgia, USA.